This course prepares the student to serve effectively as an organizational spokesperson, according to current practices in the profession of public relations and numerous examples from the fire service. Particular emphasis will be placed on case studies in crisis communications and the Public Information Officer’s role in the Incident Command System. NOTE: This course is an approved elective for Fire Inspector II and Fire Officer II, and also for Instructor’s Re-certification. This course is designed to present the principles of management theory, and its application in the fire service. The course is intended for officers whose area of responsibility encompasses long and short range planning, budgeting and administration. This curriculum is geared toward teaching the student how to assimilate information contained in working, drawing and specifications as they relate to the fire inspector. The curriculum includes how to interpret conventional graphic communications. Accepted standards and conventions are introduced. Symbols, abbreviations, principles of technical projection, as well as a review of construction arithmetic and geometry, are included. Related worksheets are used to allow for applied experience of finding and interpreting information from authentic drawings. Students must bring an architectural scale. 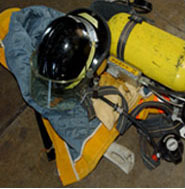 Meets or exceeds OSHA standards for confined space rescue and meets requirements for NFPA 1670 “Technician Level”. Class covers and surpasses “Awareness” and “Operations” Level. Class covers identification, hazards, entry permit systems, supplied air respirators, mechanical advantages, hauling and lowering systems. Also covered is air monitoring and ventilation. Bring helmet and gloves to class–knee and elbow pads are optional. IFSTA Pumping Apparatus Driver/Operator course meeting NFPA 1001 requirements for driver/operators. 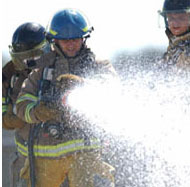 Covers basic pump theory, effective use of fire streams, fire pump operations, and hydraulic concepts. Complex application situations are covered. Students who complete this course will be able to sit for the State Pump Operators Test. 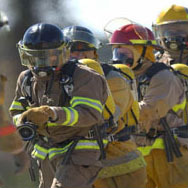 This 20-hour course is designed for firefighters preparing to take their Fire Department’s Engineer’s Test, or for students just needing to review the material again. The student will demonstrate an understanding of the pump operator’s responsibilities while operating from the pump panel for a given fire evolution. The student will show that he/she understands how to calculate the proper friction loss while maintaining proper flow and pressures during the evolution. This portion of the program is a vital segment in completing the Fire Prevention Inspector’s Certification requirements. This course is designed to familiarize inspectors with the five basic units of NFPA 101. This course includes statewide fire prevention code NFPA 1. This is a study of private fire protection and detection systems, such as sprinkler and standpipe systems, chemical extinguishing systems, detection systems and devices. Each system is discussed as to its need, construction, preventive maintenance and individual uses. The curriculum draws from many recognized authorities in exploring the methods and mechanics of imparting information and adult learning principles. The course emphasizes techniques that have wide application in teaching situations, as well as devices for specific areas. Also stressed is teaching effectiveness through the use of media and visual aids. This class is based on lecture, practical exercises, and/or field trips. The curriculum is designed to cover basic factors involved in coping with an emergency scene and determining the best use of available resources in protecting lives and property. 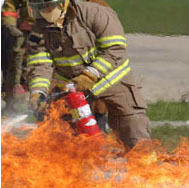 The course emphasizes the changing nature of an emergency situation and the ways in which the fire officer can evaluate the effectiveness of his or her proposed Incident Action Plan. The curriculum deals with building construction. Topics include identifying hazards from assault by fire and gravity, how building construction can influence fire spread, fire confinement or structural collapse, and many other life safety issues. This is not a building course per se, but rather a course to identify construction features and their hazards under fire conditions. Designed to assist fire officers in solving the varied problems and situations they will be required to manage effectively in today’s ever-changing fire service. The curriculum includes a review of fire department organizations and administration, management theory, leadership, communication, motivation, and small group dynamics. (Prerequisite: Fire Fighting Tactics & Strategy 1) The curriculum covers multiple company operations, logistics, strategy, and use of mutual aid forces and conflagration control. The course is intended for officers who may be in command of fires and other emergencies involving close coordination and maximum use of large amounts of manpower and equipment. Typical tactical situations and case histories are given. The development of critical thinking skills is stressed. In this course, the student must demonstrate knowledge of the principles and features of an incident command system, how an incident command system is organized, incident facilities and their purposes (such as but not limited to command post, staging area, bases, camps, and heliports-helispots), incident resources such as strike teams, task forces, and single resources, such as strike teams, task forces, and single resources, and common responsibilities, such as communications and forms, in incident management. 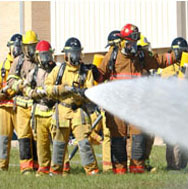 the student will also be able to list and describe the duties of various positions within the incident command system, construct an incident management organization for a given incident or event, including appropriate procedures for establishing command, transferring command, and terminating an incident demonstrate knowledge of efficient incident resource management including logistics, finance, administration, and record-keeping, demonstrate a familiarity with air operations, and demonstrate knowledge of incident planning processes. This course is designed to meet the training needs for initial attack incident commanders and company officers confronting wildland fire that threatens life, property, and improvements. Units include: size-up, initial strategy and action plan, structure triage, tactics, action plan assessment, public relations and follow-up, and safety. In addition, this course is designed to help you learn principles used in suppressing fire and/or protecting structures in a wildland urban interface area. This course covers safe vehicle emergency driving methods and the laws that apply to the firefighter. Also, vehicle control, accident avoidance, safety checks, wet weather and night driving are included. Both classroom work and driving course evolutions are involved with this course structure. This course covers basics of patient extrication and packaging for emergency transport. 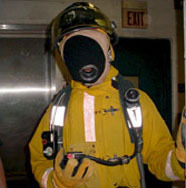 Subjects covered are anatomy, physiology, emergency care procedures for illness and trauma related conditions, gaining access, entrapped victims, packaging techniques, and the OSHA required exposure control program. Personnel who successfully complete the program will receive First Responder and CPR certifications. Subjects covered include: Compliance with NFPA 1500 and 1561, OSHA CFR 29 1910.134 (g) (4) Florida Statute 4A-62.003. 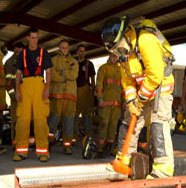 This training program is designed for firefighters to Chief Officers who could be involved with mayday situations involving an endangered firefighter on the fire ground. It consists of 4 lecture hours and 20 hours of intensive hands-on training. Students will train in acquired structures as well as on the drill field. 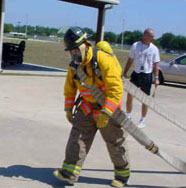 Course deals with a hands on approach to Firefighter Survival techniques using rope. Subject matter includes various scenarios, rope construction, maintenance, knots, anchors and escapes systems. 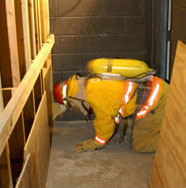 Topics such as escaping the building with tools for anchors, rope retrieval and numerous descents lead to a final scenario escaping from a 6 story roof in full PPE and airpack, utilizing skills mastered during the week. Class meets or exceeds the requirements of NFPA 1670 on technical rescue for Rope Rescue “Operations Level”. Student will learn various ways of dismounting and rappelling. Skills include mechanical advantages, lowering systems and hauling systems with a focus on safety. Students will work in teams to complete various rescue scenarios including pick-offs, stokes baskets. Class meets or exceeds NFPA 1670 on technical rescue for Rope Rescue “Technician Level”. Topics include more advanced hauling and lowering systems, complex mechanical advantage systems and highline or Telpher line operations. This class also addresses management of rope rescue operations. Pre requisite: Rope Rescue Operations. Meets or exceeds OSHA standards and “Technician Level” for NFPA 1670. Class includes Awareness and Operations Level. Class involves hand on work with ground pads, moving spoil piles, sheeting and shoring. Student will use hand and power tools and pneumatic shores also. Scenarios include straight, L, and T trenches, as well as, use of wales, and supplemental shoring.